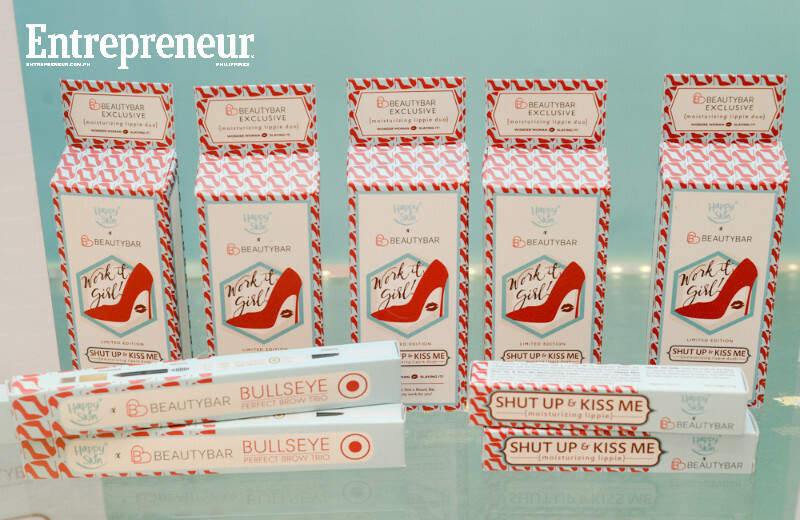 The premise was simple: Create a makeup line for Filipinas without ruining their skin. Anyone could have done it but it was the smart and stylish duo of long-time model Rissa Mananquil-Trillo and former Unilever brand manager Jacqe Yuengtian-Gutierrez who successfully made the goal a reality as it launched Happy Skin in October 2013. The brand has managed to grow to 85 counters in less than three years even when a quick look on beauty counters inside local malls show that 90% of them are international cosmetics brands. Well, if their first brick-and-mortar store in Glorietta Mall in Makati City, alongside big, international names of MAC Cosmetics, Benefit, and NARS is saying something, the brand has kept and intends to keep more Filipino women happy. For someone who has been a model for 15 years, part of the job is long makeup sessions and Trillo admits she may had every brand out there put on her face. “Makeup can easily prettify you. But the odd thing about it is, at the peak of my modeling career, was when my skin was at its worst. Makeup can really ruin the skin,” Trillo said. The model-turned-entrepreneur’s deeply-rooted experience with cosmetics has become a strong pillar of the brand in formulating its case: a makeup that cares for the skin. “It’s women’s complaints that inspire our products. Happy Skin is a dual citizen of skin care and makeup. We want a makeup that cares for it,” Trillo said. To achieve such goal, the team tapped the minds from the beauty capitals in Asia—Japan, South Korea, and Taiwan—to formulate and import their products. This meant flying to these countries and testing products themselves and studying formulas with their suppliers. The result is a stellar selection of more than a hundred cosmetic products, varying from lipsticks to concealers. While this may be another set of cosmetics, Happy Skin prides itself to be a safe brand to use even for those with the most sensitive skin, as each product holds a key ingredient. An example is Zit Zapper Second Skin Cream, a silicon-free foundation which helps women with acne problems to still have great makeup coverage without hurting their skin because of its salicylic acid content, eliminating the clogging residue that causes breakouts. “I think the single biggest reason Filipinas like Happy Skin is because we fulfill not just their beauty wishes but equally address their frustrations with makeup,” Trillo said. While it helps that Happy Skin’s founders are part of the market it wants to tap, the founders’ meticulous and hands-on approach to almost every step of the business transcends well beyond the core products and exude every bit of business knack, as if the two are no first timers in business. The brand’s use of the bright colors of pink and teal and witty product names such as the Don’t Get Mad, Get Even foundation and Shut Up and Kiss Me lipsticks enthuse a bright and friendly vibe, enough to invite and capture the long-time makeup users and those starting using cosmetics. “A lot of women are intimidated to use makeup mainly because when you go to a beauty counter, [there are] almost 50 shades of eyeshadow [and] lipsticks. Ultimately, what a regular woman wants is to look good without making it difficult for her,” Trillo said. Even with such winning differentiator, in this digital era where anything and everything may be reached in a click, Trillo understands that what sets a brand apart from the rest is customer service and easy access to the market. A study by Hitachi Consulting in 2015 showed that 90% of consumers research online first before making a purchase, and 60% of those who own a smartphone use the gadget while in-store for price differences and reviews. True enough, a credit to Happy Skin’s success is the brand’s organic growth online. While organic and digital may not be terms that can be put together, in the digital realm, becoming a brand with an authentic, relatable voice to its audience is a winning factor. Something that Happy Skin has successfully done. “You want to have a variety of content that engages people and empowers them. We’re not [into] hard sell where people skip us. What matters is to have thumb-stopping content,” Trillo added. The brand may have only started on Instagram in October but it has become its biggest leverage since. As of this writing, Happy Skin has 110,000 followers on Instagram and more than 63,000 fans on Facebook. Its healthy mix of product placement, cosmetics, and skin care tips with eye-catching posters has given it an image of a friend. “Social media is a great equalizer. We don’t have big budgets, we can’t afford commercials or billboards but social media has become our strongest marketing tool. It gives opportunity to young, homegrown brands to make themselves known,” Trillo added. The Happy Skin co-founder admits four out of five of the customers who visit their physical stores discovered the brand through social media, a testament that a brick-and-mortar store is still not something to be taken for granted. “This is makeup, it’s something you want to feel, touch, and try,” Trillo said. It may be fun, glamorous, and pretty but the cosmetics industry entails a lot of hard work and Trillo has had her own dose of it. “When we were starting, it was really a mixture of blood, sweat, and tears. Jacque and I were not only founders, we were also sales girls, kargadors (stevedores). When we launched the brick and mortar store, we were up until 2 am still cleaning the whole place since it was full of dust. It’s part of the birthing pains of any startup, and you must be willing to endure that,” Trillo said. To easily switch roles from the brand’s living image into someone who puts the dirty work says a lot about an entrepreneur’s drive to succeed, with a lot of risks along the way. One of the chances they took was when they sent their products to TV host Kris Aquino, barely a month in operations. “Lucky enough we were called to guest in her show, and it was a really big boost to the brand because of course, Kris is the ‘Oprah of the Philippines,’” Trillo said. That chance snowballed into a collaboration with the TV host, the first for both parties, as they launched an exclusive lipstick with Aquino’s name on her birthday, February 14, 2014. Since then, the company has had a string of collaborations with various names in the cosmetics and fashion industry, including stylist Liz Uy; skin care brand Pond’s; and clothing brand Plains and Prints. A collaboration with actress Heart Evangelista-Escudero will also be launched in July. “When you’re an entrepreneur, you have to be bold, brave, and fearless. There’s a lot of risk in starting a business but remember taking risks can also be very rewarding,” Trillo said.